Interstate 94 is a lengthy route connecting the High Plains, Upper Midwest and Great Lakes regions. It originates in Billings, Montana splitting with Interstate 90 and following the Yellowstone River northeast to Glendive before curving eastward to Wibaux and Beach, North Dakota. The freeway crosses the width of North Dakota, traversing the hills of Little Missouri National Grassland to the wide open plains from Dickinson east to Bismark and Fargo. Fargo is the largest city in North Dakota, and I-94 expands to six lanes as it passes south of Downtown. The freeway crosses the Red River into Morehead, Minnesota where it turns southeast toward Fergus Falls, St. Cloud and ultimately the Twin Cities. Once at Maple Grove, a suburb of Minneapolis, I-94 splits with Interstate 494, the southwest beltway of the Twin Cities, for an increasingly busy route east to I-694 and south into Minneapolis. As I-94 encircles Downtown Minneapolis, the freeway utilizes a cut and cover tunnel both just south of I-394 and west of the 90 degree turn toward Interstate 35W. A brief side by side route occurs with I-35W ahead of their respective crossings of the Mississippi River. Continuing east from Minneapolis, Interstate 94 heads toward Downtown St. Paul and the confluence with Interstate 35E and split of U.S. 52 south. The freeway leaves the urban area via Maplewood and Oakdale to cross the St. Croix River into Wisconsin. Much of the drive through western areas of America’s Dairyland is rural, as I-94 veers southward again at Eau Claire to combine with Interstate 90 at Tomah and Interstate 39 at Portage. The trio share 29 miles southward to Madison. I-94 takes a 90-degree route east from the Wisconsin capital city to Milwaukee and south by Racine and Kenosha to northern Illinois. The route combines with Interstate 43 from I-794 at Downtown Milwaukee to the south end of I-894, the Milwaukee bypass. Interstate 41 overlaps with I-94 south from there to Exit 1 at Rosecrans, Illinois. Through the Chicago area, Interstate 94 follows the Tri-State Tollway south to both I-294 and the Edens Spur. The tolled spur links the Tri-State Tollway with the Edens Expressway, which Interstate 94 takes south to its merge with Interstate 90 along the Kennedy Expressway. The Kennedy carries both to the Chicago Loop, where the Dan Ryan Expressway and Eisenhower Expressway (I-290) come together. The 15.39-mile overlap between I-90 & 94 concludes at the Dan Ryan interchange with the Chicago Skyway in south Chicago. I-90 veers southeast on the toll road to Calumet City, Indiana, while I-94 remains southward along the Dan Ryan to I-57 and the Bishop Ford Freeway. Following the Bishop Ford Freeway, Interstate 94 heads south to South Holland and Lansing, where the freeway resumes an eastward course along side Interstate 80 on the Kingery and Frank Borman Expressways through northwest Indiana. The 18.53-mile overlap with I-80 ends at Lake Station where Interstate 80 departs for I-90 east along the Indiana Toll Road toward Toledo, Ohio and I-94 shifts northward along the periphery of Lake Michigan to Michigan City and Benton Harbor, Michigan. A 275-mile route in Michigan sees Interstate 94 turn east at the split with I-196 for Kalamazoo, Battle Creek, Jackson and Ann Arbor. The freeway shifts southward on the approach to Detroit, passing by Detroit Metropolitan Wayne County Airport (DTW) at Romulus along the Detroit Industrial Freeway. Joining the Edsel Ford Freeway at Dearborn, Interstate 94 angles northeast through Detroit to the Grosse Pointe cities and a northern turn to Macomb County. 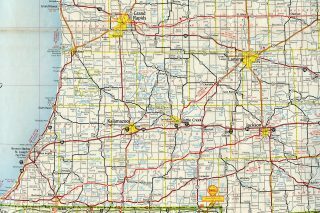 A rural stretch awaits drivers along I-94 northward from New Baltimore off Anchor Bay to Port Huron and the merge with Interstate 69. I-69 & 94 share pavement for 3.7 miles to the international boundary along the Bluewater Bridge east to Sarnia, Ontario. Interstate 94 from Chicago to Port Huron is part of High Priority Corridor 18: NAFTA Superhighway. Interstate 94 replaced U.S. 10 from Billings east to Fargo and U.S. 52 (former U.S. 10S) between Fargo and Minneapolis. From Minneapolis southeast to Madison, Wisconsin, Interstate 94 follows U.S. 12, and it replaced U.S. 16 from there east to Milwaukee. At Milwaukee, Interstate 94 turns south to merge with or parallel U.S. 41. Once in Indiana and continuing east, it parallels U.S. 6 and U.S. 12-20. Northeast of Indiana, when Interstate 94 enters Michigan, the freeway replaced the original alignment of U.S. 12. (Today’s U.S. 12 was rerouted onto former U.S. 112.) U.S. 12 ends in Detroit, and Interstate 94 replaced U.S. 25 from there northeast to its terminus at Port Huron, Michigan. A $810-million project improved the Marquette Interchange (Interstates 43, 94 and 794) in Milwaukee between spring 2005 and December 31, 2008. Originally constructed between 1964 and 1968 and opened in December 1968 for a cost of $33 million, traffic counts at the Marquette Interchange increased to over 300,000 vehicles per day, more than double what was intended.2 Road work redesigned the interchange to utilize entrance/exit points only from the right side of the freeway, have longer merge lanes, and reduce impact to neighboring communities. 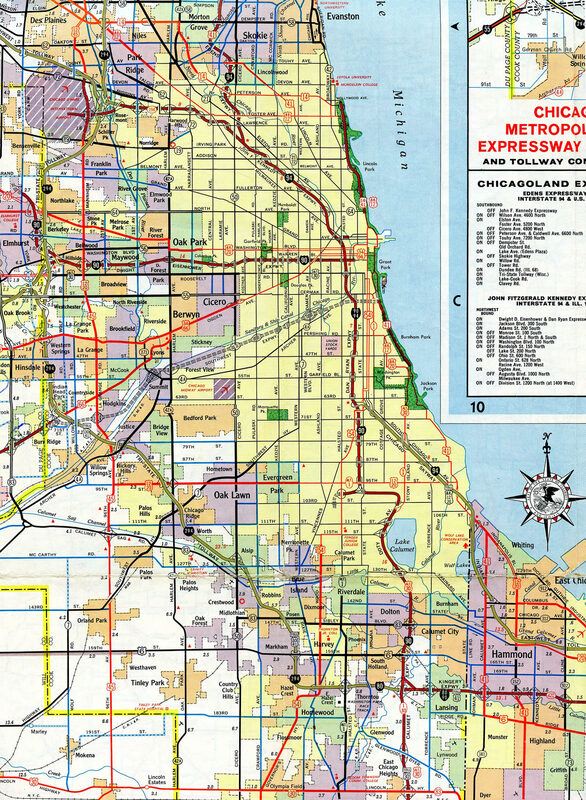 Until 1963, the alignments of Interstates 90 and 94 were switched from south Chicago to northwest Indiana. I-94 used the Chicago Skyway and Indiana East-West Toll Road, while I-90 remained along the Dan Ryan and Calumet Expressways south to the Kingery and Borman Expressways. This included an extension of Interstate 294 east into Indiana to meet with I-94 at Lake Station. 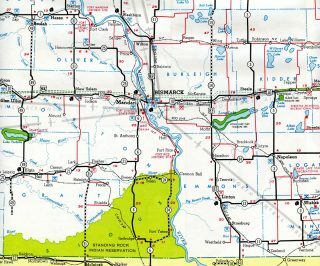 Interstate 94 displaced the old alignment of U.S. 10 east from Medora to a point just west of milepost 30. The remainder of U.S. 10 parallel to I-94 to Painted Canyon was demolished. The Painted Canyon Visitor Center off Exit 32 was located along the former US highway. Old U.S. 10 is drivable again along 36th Street SW south of Exit 36. According to Scott Oglesby’s Kurumi.com website, there were plans in 2003 to renumber the Interstates in and around Milwaukee to decrease traffic impact in Downtown Milwaukee at the Marquette Interchange (junction of Interstate 43, Interstate 94 and Interstate 794) Under a plan recommended by Mayor John Norquist, Interstate 894 would be eliminated, and the entire route would be renumbered as I-94. The section of Interstates 43 & 94 would become solely I-43, and the section of I-94 between I-894 west of Downtown and I-794 would become part of a much longer Interstate 794.1 Mayor Norquist was responsible for the removal of the remnant of the Park East Freeway, which was demolished and reclaimed in stages between 2002 and 2004. This renumbering proposal may have ended around the same time that Mayor Norquist resigned from his post in 2003 to head the Congress for New Urbanism. Mayor Norquist’s successor, Tom Barrett, did not further the proposal of his predecessor. The Bishop Ford (Calumet) Expressway offers the continuation of eastbound (outbound) Interstate 94 from the Interstate 57 split to the Kingery Expressway; it was one of the first express routes to be built in Chicagoland, opening in the early 1950s (around the same time as the Edens Expressway). The Kingery Expressway section of Interstates 80-94 & U.S. 6 is one of the oldest sections of I-94 in Illinois, having opened in 1950.11 This is also the only section of Interstate 94 that truly travels east-west in Illinois. Eastbound Interstate 94 at Interstate 69 west and Business Loop I-69 east in Port Huron. I-69 and I-94 merge for the final distance toward the Blue Water Bridge. Photo taken by Jim Teresco and Rob Foulis (06/27/01). Traveling east on Interstate 69 at the directional T interchange (Exit 198) with I-94 west. Business Loop I-69 splits at the ensuing ramp to the couplet of Oak and Griswold Streets into Port Huron. I-69 & 94 combine eastward to the Bluewater Bridge to Sarnia, Ontario. Photo taken by Jeff Morrison (06/25/07). Freeway ends sign posted at the Water Street off-ramp. The final mile of I-69/94 east connects with M-25 north to Port Austin. Photo taken by Jeff Morrison (07/01/07). A left exit formerly departed for M-25 (Pine Grove Avenue) north. This ramp was closed during reconstruction of I-69/94 in 2011-12. M-25 follows the pre-1972 northern extent of U.S. 25. Photo taken by R. Bruce Telfeyan (07/24/04). I-69/94 east ended as traffic separated for M-25 and the Blue Water Bridge across the St. Claire River to Ontario 402 and Sarnia. Photo taken by Jeff Morrison (06/25/07). Ascending onto the Blue Water Bridge from the end of I-69/94 eastbound. There are no other crossings of the Great Lakes between Port Huron and the Mackinac Bridge along I-75 between Mackinaw City and St. Ignace. Photo by John Harmon (02/01). Situated at the mid-point of the Blue Water Bridge, this International Boundary Commission plaque marks the border between the United States and Canada. Photo by R. Bruce Telfeyan (07/24/04). Interstate 94 west lowers two miles from the hills east of Billings to end at Interstate 90 & U.S. 87-212. Photo taken 08/07/16. Spanning Coulson Road, one mile ahead of the trumpet interchange (Exit 0) with Interstate 90. Photo taken 08/07/16. The westbound mainline of Interstate 94 defaults onto I-90 & U.S. 87-212 into the city of Billings. The freeway passes just south of Downtown, with a business route looping into the business district. Photo taken 08/07/16. Exit 0 loops away from I-94 west to Interstate 90-U.S. 212 east & U.S. 87 south to Hardin and Sheridan, Wyoming. Outside of a 16-mile section through Sheridan, U.S. 87 remains concurrent with I-90 to Interstate 25 at Buffalo, Wyoming. Photo taken 08/07/16. Interstate 90 ventures northeast through industrial areas of east Billings to the split with Interstate 94 (Exit 456). Photo taken 08/07/16. Advancing beyond the Johnson Lane exit, a diagrammatic sign outlines the TOTSO continuation of Interstate 90 east at Exit 456. Photo taken 08/08/16. 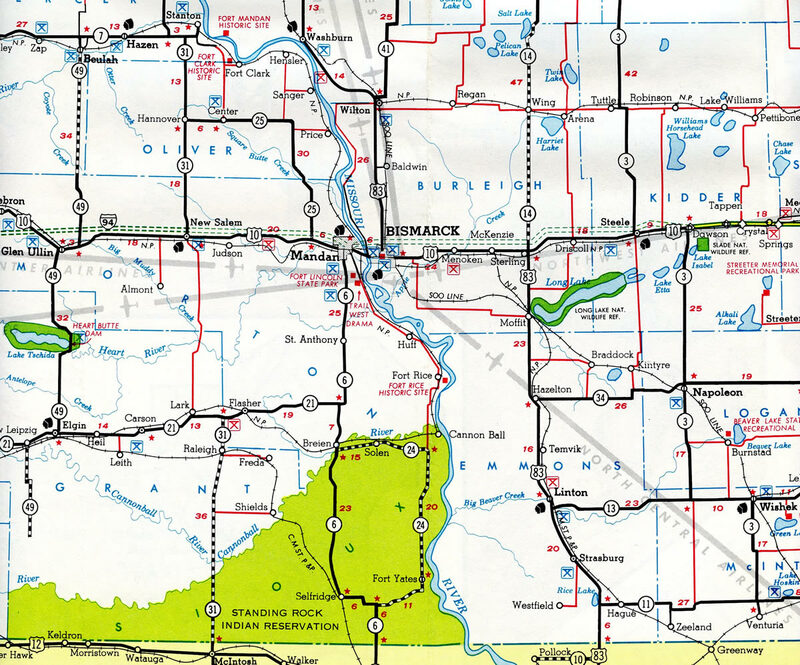 I-90 and U.S. 87-212 turn east at the forthcoming split to traverse Pine Ridge from I-94 to Hardin while I-94 parallels the Yellowstone River northeast to Miles City and Glendive. Photo taken 08/07/16. Interstate 94 commences a 410-mile course to Bismarck as the through route from I-90 east at Exit 456. The next major population center along I-94 is Miles City, located 138 miles away. Photo taken 08/07/16. Interstate 90 traverses a ridge line east of Billings on the approach to Exit 456 with I-94. The initial guide sign is the lone reference for Miles City. Photo taken 08/08/16. The broad Yellowstone River valley comes into view as I-90 lowers toward the trumpet interchange (Exit 456) with Interstate 94 east. Photo taken 08/08/16. A 5.2 mile exit less stretch along I-90-U.S. 212 west & 87 north concludes at the west end of Interstate 94. I-94 enters Billings from Huntley, six miles to the northeast. Photo taken 08/08/16. Interstate 90 west overtakes the ending I-94 at Exit 456, four miles east of the Billings city limits. This is not the only time Interstates 90 and 94 meet. They previously overlapped between Madison and Tomah, Wisconsin and from Lake Station, Indiana to Chicago, Illinois. Photo taken 08/08/16. Marquette Interchange http://www.mchange.org/ – official site. Lokken, Chris. Personal Email, “Some Information on Wisconsin Interstates,” April 7, 2006. “I-94/I-69 reopens near the Blue Water Bridge in Port Huron.” MDOT press release, October 19, 2012. “Governor Blagojevich announces completion of Dan Ryan reconstruction – A safe and wider Dan Ryan Expressway; IDOT to open up all lanes to traffic ahead of schedule.” Office of the Governor, press release, October 25, 2007. “Lanes of I-94 reopen at I-69 interchange.” The Times Herlald, December 19, 2014. North Dakota Highways Page: Highways 61 to 100, http://www.northernplainshighways.org/ndakota/nd61-100.html Chris Geelhart. 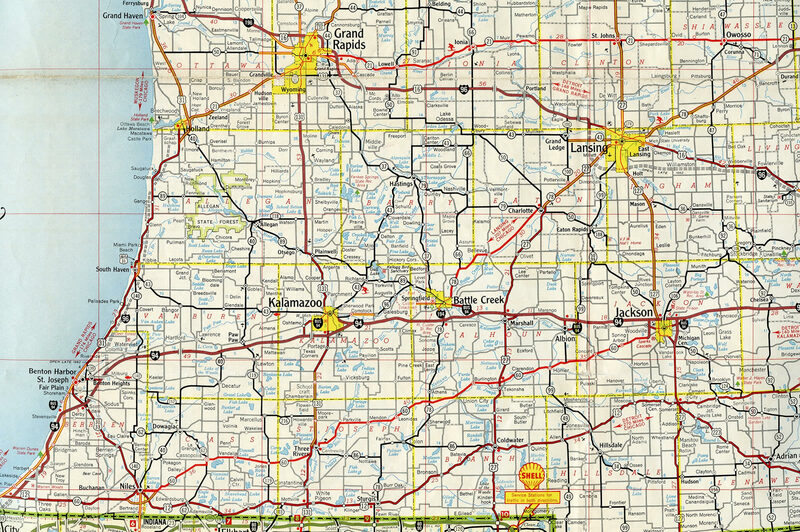 Michigan Highways: Highways 90 through 99. Chris Bessert. “Montana Road Construction Contracts Are Awarded.” The Spokesman-Review, April 20, 1961. “Residents Laud Change To 4-Lane On Local Stretch.” The Billings County Pioneer, May 14, 1965. “Interstate changed way North Dakotans lived.” Bismarck Tribune, The (ND), June 24, 1996. “I-94 Opens Between Mandan and Bismarck, 1965.” Bismarck Tribune, The (ND), December 11, 2015.